July 19, 2018 — It was clear from the time she was young that Larissa Hautekeete ’89 was destined to be a veterinarian. In elementary school she was the one who cared for the classroom gerbils, guinea pig, and fish over the holidays. She always had a dog, and she wanted to bring inside the baby bunnies who were living in the family’s backyard. It’s no surprise, then, that Hautekeete practices veterinary medicine at a small animal hospital in suburban St. Louis. She also is caring for her alma mater. As a co-class fund director, Hautekeete is helping create relationships with classmates that deepen the class of 1989’s philanthropic relationship with the College. Ask about her philosophy and Hautekeete will explain that she and her husband, Rick, are longtime volunteers whose lives in large part are defined by giving. The two serve numerous roles at their church, from singing in the choir to assisting at services to working in the church garden and helping with the food pantry. They’ve participated in Habitat for Humanity and other service days through work and church. Rick has been a Boy Scout leader; and Larissa, who swam four years at Grinnell, volunteers her time officiating and working at swim meets. They have also set aside a percentage of their estate for Grinnell. “We think that everyone should have an opportunity to get the best education they can. By giving to the College we’ll be helping students at some point in the future,” she explains. “Grinnell did a lot for me,” continues Hautekeete, who arrived on campus intent on studying math, science, or German. Besides swimming, she sang in the choir and with the Grinnell Singers, and worked all four years as a lifeguard, swim instructor or tour guide/driver for the College. After a challenging sophomore year focused on math, she became a biology major with the goal of practicing either human or animal medicine. “I think it was differential equations that made me think I wasn’t quite getting the math degree,” she says. Hautekeete is the daughter of a career U.S. Army dentist. “I’ve lived on every coast of the U.S. and in the middle, all before I was in high school,” she says. She’s also an international traveler. Hautekeete, Rick, and their two kids spent six years in Basel, Switzerland, where the tri-lingual vet (German, English and very passable French) worked in drug safety for Novartis Animal Health. 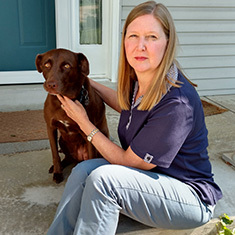 Hautekeete earned her Doctor of Veterinary Medicine in 1993 at Iowa State University, then worked at several practices in Illinois, before earning a master’s in veterinary biosciences while working at a veterinary poison control center in Urbana-Champaign, Illinois. While she has plenty of stories about traveling – one of her favorite things to do in a foreign country is to visit grocery stores to see what locals eat – Hautekeete has more than a few animal stories, too. As a vet student, for example, she completed a short internship in rural Iowa. A client brought in a duck that had been attacked by a fox. She saved the duck’s life by amputating a badly injured leg and the duck went on to live another year, until it was attacked once more by a fox, this time fatally. And at her first job, she was sent on an emergency equine call – her first ever – to treat a foal who’d been kicked in the head by a mare. She successfully anesthetized the foal, stitched its head, and avoided getting kicked, all while assuring the worried owner that everything would be fine. These days, between raising two teens, volunteering, and working, the Hautekeetes have just one animal at home, a well-treated dog. She likes being a class fund director. Learn more about Grinnell College class fund directors and the role they play. For more information about becoming a class fund director, contact Mary Zug, assistant director of annual giving, at zugmary1@grinnell.edu or 641-269-4554.